Is it really Thursday already? It’s been a busy week! Time to post again. So last weekend, MY plan was to finish stripping the dining table. Unfortunately, the weather’s plan was to drizzle all day Saturday and part of Sunday. That made a no-go for my outdoors only project. Luckily, the weekend was not wasted, and neither was the rain. 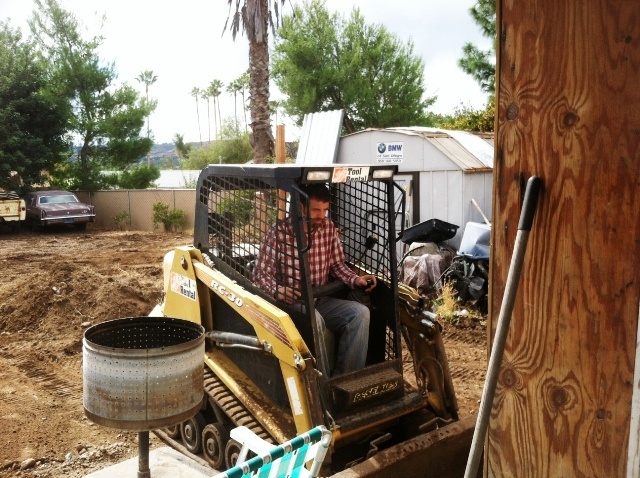 The Chief borrowed a Bobcat from a builder he knows (you know, one of those adorably mini bulldozers) and graded the backyard. I haven’t show a single picture of the backyard. You can guess why. Ok. I’ll be specific, I hate when people make me guess. 1. The house is a fixer-upper on a slow timeline. 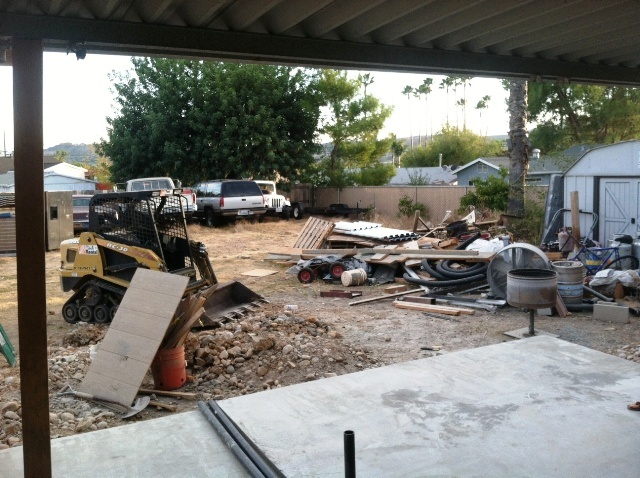 All the project debris and leftovers and, yes, trash, has somehow migrated to the backyard. 2. There is no grass. The dirt and dried weeds merely exist to hold the stones in the soil together. As far as trees, there is one lone palm tree that we don’t actually want. 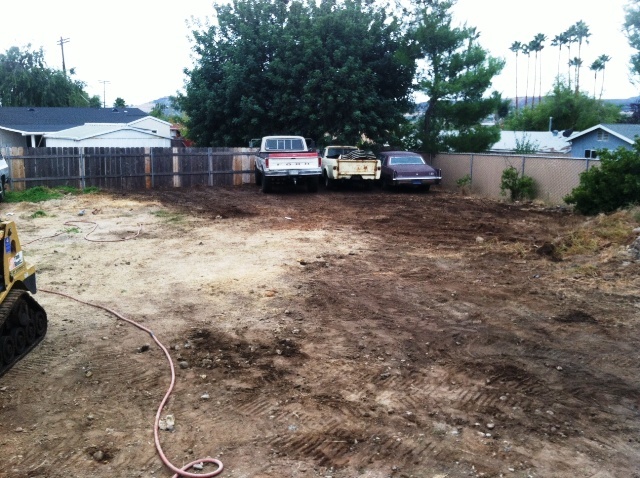 Here is what our backyard looked like at the beginning of the weekend. Then the Chief sorted the various scattered junk into piles. 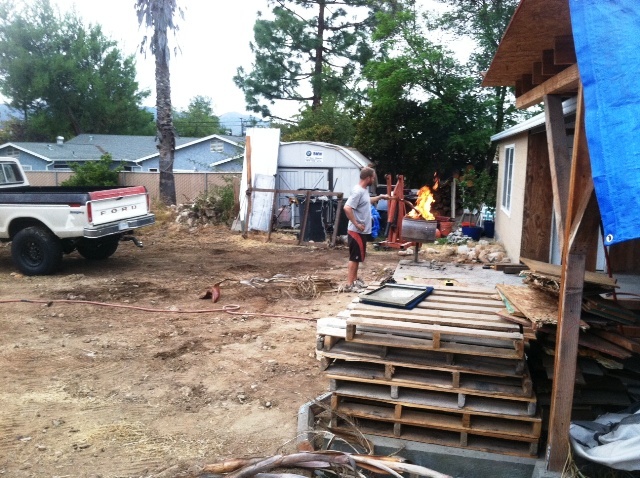 Trash pile, keep pile, burn pile, good wood to reuse pile. We had friends on Saturday who helped and kept us company. Then there was much juddering and jolting of the Chief’s fine self (and resultant headaches) as he spent hours in the Bobcat on both days scooping and dragging and tamping and redistributing good soil, rocks, and fill dirt. The drizzle was a blessing after all because it kept down the dust from the Bobcat moving earth around and helped make leveling and grading easier. 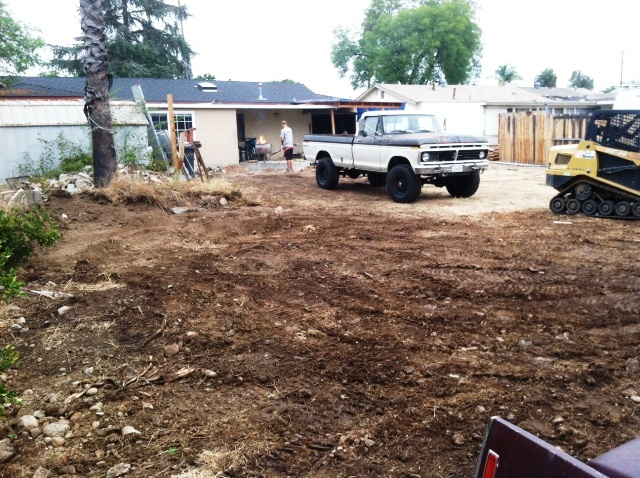 We still had to bring over the hose and spray the dirt a bit as things dried out so the Bobcat could keep grading efficiently, but we definitely saved a lot of water because of the rain. We ended up with a big pile of good dirt that was full of rocks (visible on the left edge of the previous photo) which the Chief and I spent several hours sorting through by hand on Sunday to get the biggest rocks out. Picture me ruffling through the dirt like a dog, making a pile of cleaned dirt behind me and tossing all rocks fist-sized or bigger into the frontloader of the Bobcat to be dumped elsewhere. So that’s the latest on the ole homestead. Now it just needs that fence to enclose half the yard, and a veggie bed and chickens and grass and civilized green growing things! What do you think? We still have a long way to go but I am inspired by the changes. Not built in a day, that’s what. Or, you know, stripped of paint as the case may be. I hoped I might be lucky with the refinishing of our Craigslist dining table so that it went from Before to After inside of a week. Alas, it was not to be. The girl at the hardware store can’t have ever used the product she recommended, because it was NOT at all Oh just use a little of it and the paint comes right off. No. The reality is that it takes multiple applications, more paint stripper than you would think, a lot of waiting time, and quite a bit of elbow grease to get a single layer of factory finish off our white and yellow farmhouse table. 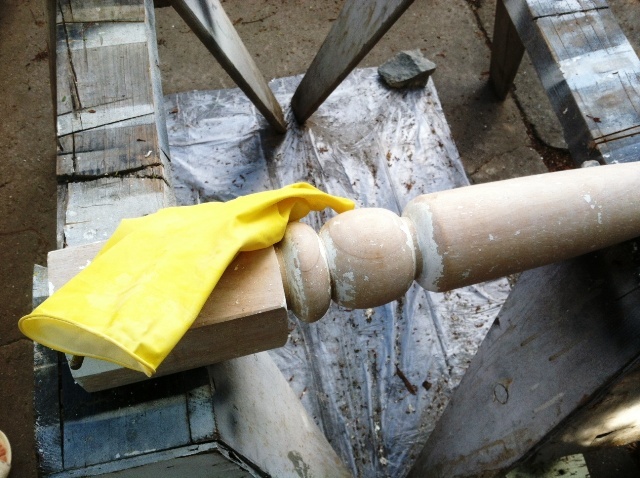 God bless my mother, who spent part of her vacation with us last week getting paint off the crooks and crannies of turned table legs! Thanks, Mom :) She left me with the (easy, flat) tabletop to handle and the last of the paint on two of the four legs. This was my first time using paint/varnish stripper so it was a new process. The Chief has a chip on his shoulder about this and claims that the overly careful State of California has made all the chemicals that actually work illegal, so maybe if you live in a different state your paint stripping will go more quickly. Here’s how the process goes for us. First: We worked outside and it wasn’t as smelly as we’d feared, which was nice. A faint chemical odor was there but it wasn’t bad. We skipped dust masks but wore rubber gloves and closed toed shoes because it turns out the chemicals sting if they touch your skin! No burns, but you will get a pretty good sting for a minute. It didn’t seem to damage clothing either. 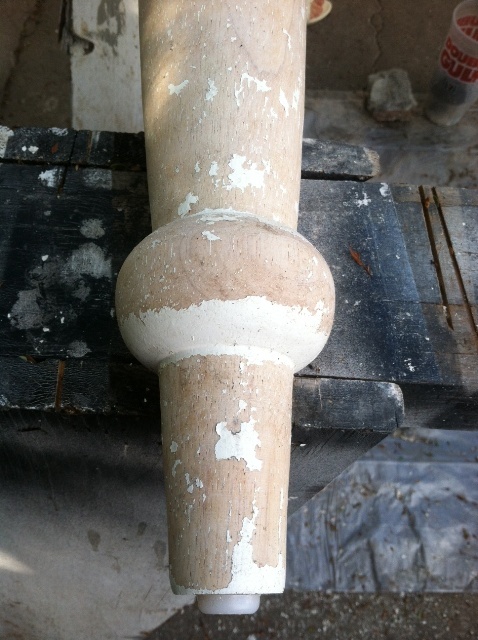 Here’s a closeup of the table leg. 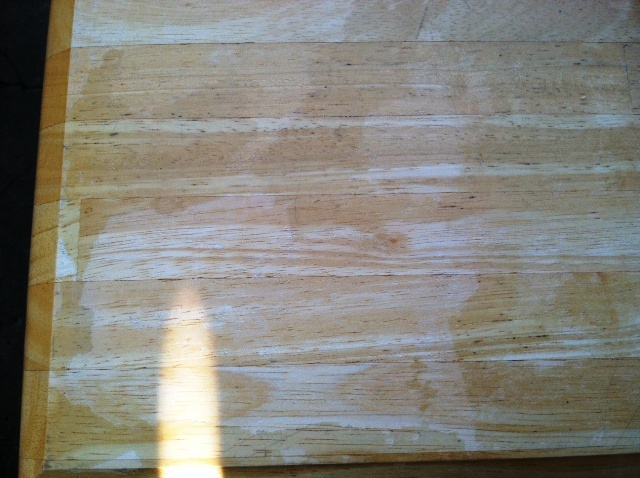 This is AFTER two previous applications of paint stripper. This is the product we used. We got both the liquid version (best for horizontal surfaces) and the paste/gel version, which does a better job staying in place on curves and non-horizontal surfaces. The first step was to brush on the paint stripper. I’m finding that dabbing it as goopily and thick as I can works best. This is Mom in the photo here, wearing open shoes for posed photo demonstration purposes only! 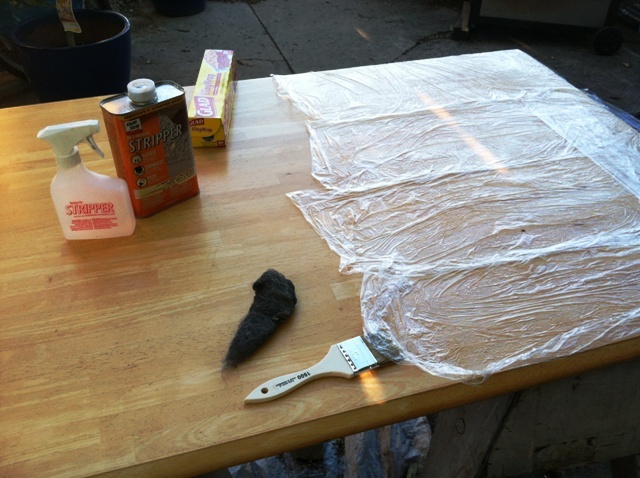 After the stripper is applied, you cover it with plastic wrap so the chemicals don’t evaporate before they do their work, and you walk away for at least 15 minutes or as directed. Plastic scrapers, steel wool, and brass bristle brushes are all useful in removing what the chemicals have loosened. Repeat as necessary… maybe a few more times that you would like to have to deal with. The tabletop is definitely going more easily than the crossgrain and crevices of the turned legs. I can do a third of the surface at a time. 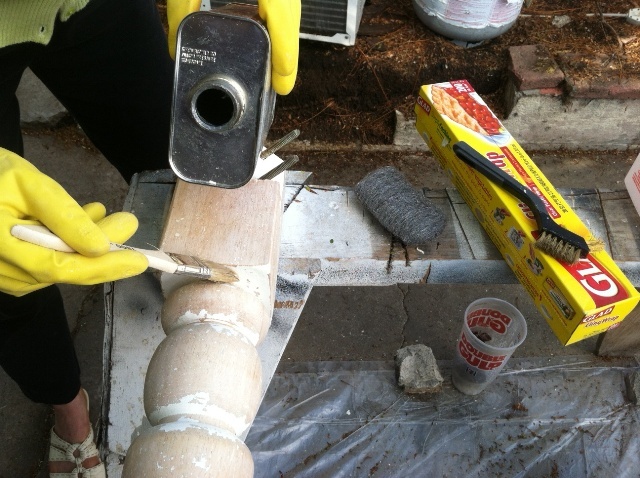 I’m going to give it one more application and then grab my hand sander and take off anything that’s left with 100 grit. 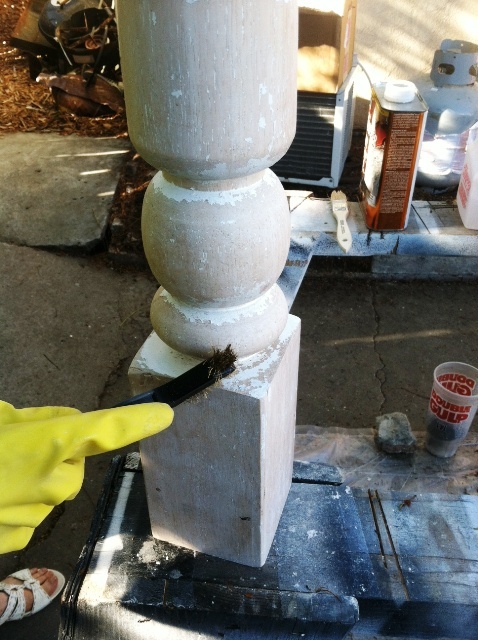 I’m hoping to finish this table up by next weekend… but we’ll see how it goes! Have you ever embarked on a refinishing odyssey? How did it go for you? We did it! We got the pickup truck on the road and brought home our new kitchen table. 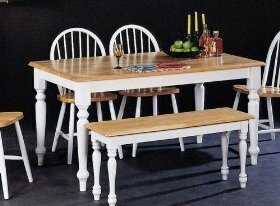 After several weeks of looking, I finally found a farmhouse table on Craigslist that was the right size, fit my criteria – except it has no leaf: I had to be honest with myself about how little space we actually have in the dining area – and it was cheeep. We got it for $60, paying for it with rolls of coins since the Chief had just emptied out his change jug. The sellers were a neat middle aged couple living in a nice part of town, and we hit it off for the brief time of our acquaintance. I think paying with rolls of quarters gave them the impression that we were struggling financially because as the husband was helping the Chief carry the tabletop out, he said not to worry, he’s been through economic downturns before and things always get better. Ha! We had a giggle about it later. I don’t know where the table is from originally, but it is a sturdy little dog! The top is solid maple, and it has these lovely chunky turned legs that look French-ish to my eye… in fact they are EXACTLY the same style legs as one of my favorite inspiration tables! Its colors are meh. Yellowy top and white apron and legs. I want a chestnut-brown tabletop, and the Chief can’t handle the white paint so that must go too. Not sure at this point if I will repaint those parts or do the rough work of sanding and restaining. Right now it looks uninspired and common, but just you wait till I refinish this baby. Our table is in pieces between the garage and the living room, so I can’t show you a before picture. I’ll be sure to get one, even if the table is jerry-rigged, before the refinishing starts. Anyway, it’s one of these numbers. Though the legs are much thicker, like this. They are great legs. It also has two shallow drawers in the ends of the table. The top just has a thin clear coat, so hopefully it won’t take too much sanding to get off (fingers crossed!) My mom’s coming to town next week for a nice long visit and had expressed interest in helping us with house projects. Guess what she will be helping me with :) Maybe I will let her sand the legs and apron. The end result, I hope, will look like this beautiful long table which I have ghetto-shopped shorter. These are practically the same legs, and these are the colors I’m going for. On a related note, I have this desperate hankering to have the kitchen/dining room area tiled in a herringbone pattern with long subway-type tiles. This desire, and possibly even the farmhouse table, is a direct result of falling in love with Tommy Smythe’s kitchen. Gee, this kitchen even has the dark lower cabinets and white painted, windowpaned uppers that The Chief and I will probably end up compromising on when we remodel the kitchen. (He wants dark wood and I want creamy paint on the cabinets, but we seem to agree on this look.) And oh yes, I also want a large lantern over the table. Apparently this kitchen has infiltrated my subconscious entirely. Well I was flipping through the Lowes circular that came yesterday and what should I see but this? Wood-grained porcelain tile in long blocks – I tore that baby out and put it in my kitchen inspiration folder! (The tiles look darker, less whitewashed, in the printed circular.) See, the black tiles in my inspiration picture are a bit too much contrast for real life in our house, but I can totally imagine these in our kitchen, with the great room’s mid-toned wood flooring coming up to to meet the tile without a drastic visual contrast. The lower kitchen cabinets would be a level darker than the flooring for some contrast without too much of a black hole effect. I’m so excited thinking about our future kitchen! There are NO PLANS to begin this remodel, but we know it will be coming down the road in maybe 3-5 years. Perhaps soon I will do a post on our current house plan and the prospective changes. Making the house prettier, one weekend at a time, that’s our motto! 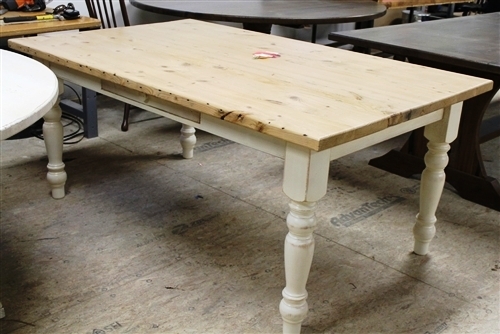 The new farmhouse table is a definite step forward. What do you think? Can I refinish it into something I love? 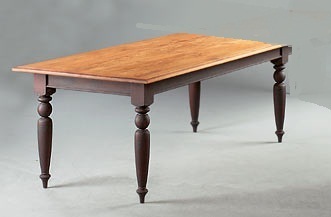 Will my mom agree to sand turned table legs? Have you planned out your future kitchen years in advance?